The Average Days in Receivables report is an Advanced Report which displays a graph showing the percentage of A/R dollars by month as well as a line graph that shows the Average days in receivables for the past year. Beneath this graph is a table showing the same information broken down by 0-30, 31-60, 61-90, 91-120 and 120+ days. Average days is displayed on the far right side for each month and maxes at 199 days. This report will show aging based upon the date of service on an encounter for outstanding charges. Payments will be factored in based on date paid. The average days in receivable is determined based upon the amount of time between the date of service on an encounter and the date the encounter reached a $0 balance, averaging how long each encounter remains open before being paid in full. 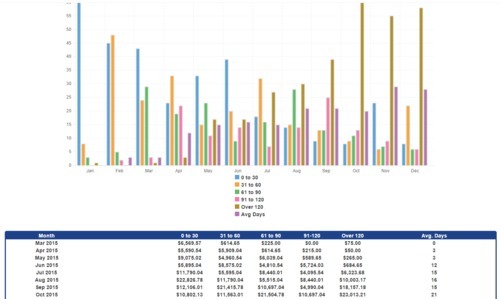 While there are no base reports in TRAKnet which show comparable historical data, the Accounts Receivable report displays information for the current time and will closely match the most recent month displayed on this report. Note that discrepancies may exist depending upon the date the report is generated, as the Average Days in Receivables report factors payments based upon date paid whereas the activity report looks at date created for payments. Graph - The top of the report is a bar graph that will show the percentage of A/R dollars and which day range they fall in. A line graph runs through this graph showing the Average Days across each month. The Y axis is the % of A/R dollars. The X axis is each month. The report shows 0-30, 31-60, 61-90, 91-120 and 120+ days in different colors on the graph. Table - Beneath the graph report there will be a table showing the following information: Month, 0-30, 31-60, 61-90, 91-120 and 120+ days and Average Days. Run Date - The date the report is generated. This will default to today's date, but setting another date will cause the report to generate results 12 months back from the date selected.